THE PRELIMINARY OBJECTIVE TEST (M.C.Qs.) 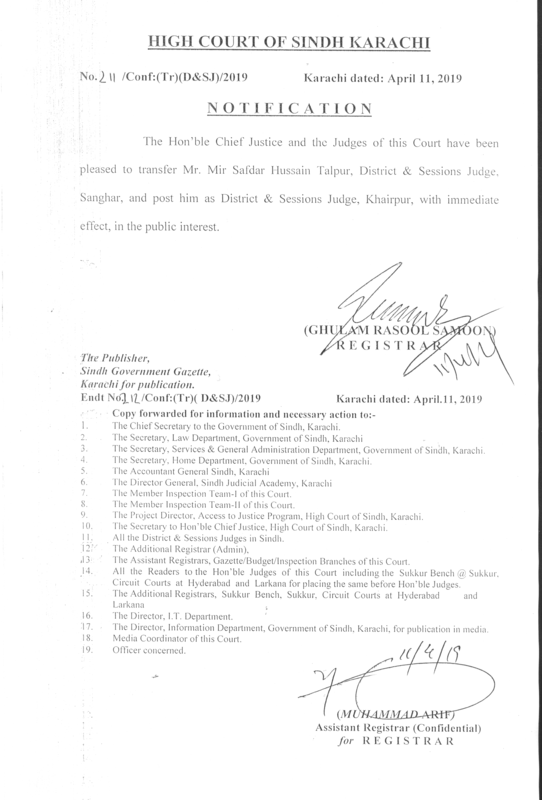 FOR THE POST OF ADDITIONAL DISTRICT & SESSIONS JUDGE HELD ON SUNDAY 07-04-2019 AT THE LAWN OF HIGH COURT OF SINDH, KARACHI HAS BEEN CANCELLED ON THE REQUEST OF SIBA TESTING SERVICE (STS). THE PRELIMINARY OBJECTIVE TEST (M.C.Qs.) 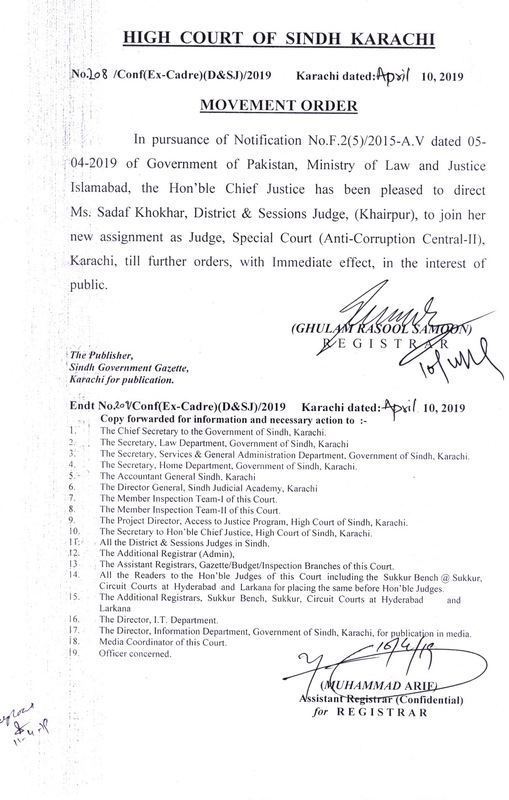 FOR THE POST OF ADDITIONAL DISTRICT & SESSIONS JUDGE IS RESCHEDULED TO BE HELD ON SUNDAY, 28TH APRIL, 2019 AT 10:00 A.M. AT THE LAWN OF SINDH HIGH COURT, KARACHI, WHICH WILL BE CONDUCTED BY SIBA TESTING SERVICE (STS). THE REPORTING TIME FOR TEST IS 9:00 A.M. AND NO CANDIDATE SHALL BE PERMITTED TO ENTER IN THE EXAMINATION HALL AFTER 9:30 A.M. ALL CANDIDATES ARE REQUIRED TO BRING ORIGINAL TEST LETTER AND ORGINAL C.N.I.C. 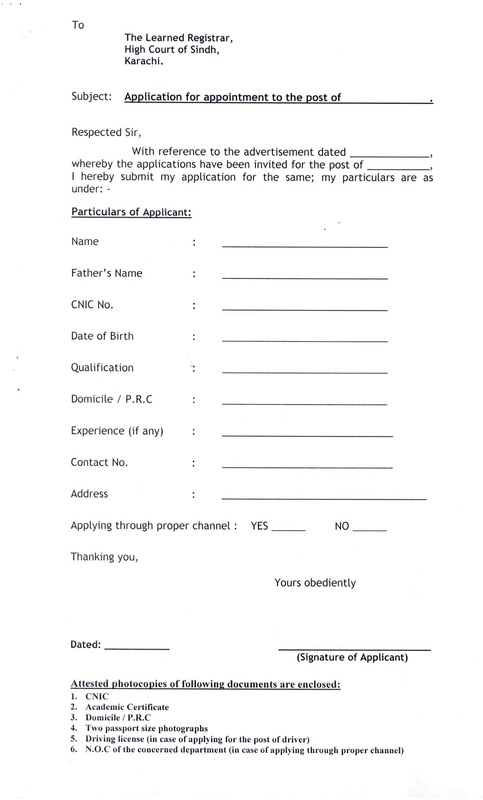 ANY CANDIDATE NOT IN POSSESSION OF ORGINAL C.N.I.C. WILL NOT BE ALLOWED TO ENTER THE EXAMINATION HALL. I)	40 PERCENT QUESTIONS RELATING TO ENGLISH LANGUAGE. THE CANDIDATES OBTAINING MINIMUM 60% MARKS IN THE PRELIMINARY TEST WILL BE ELIGIBLE TO APPEAR FOR THE SECOND WRITTEN TEST CONSISTING OF 2 PAPERS OF 3 HOURS DURATION DATE FOR WHICH WOULD BE ANNOUNCED LATER. NOTE:(1) The candidates who are otherwise eligible but shown ineligible due to objections for want of necessary documents etc. 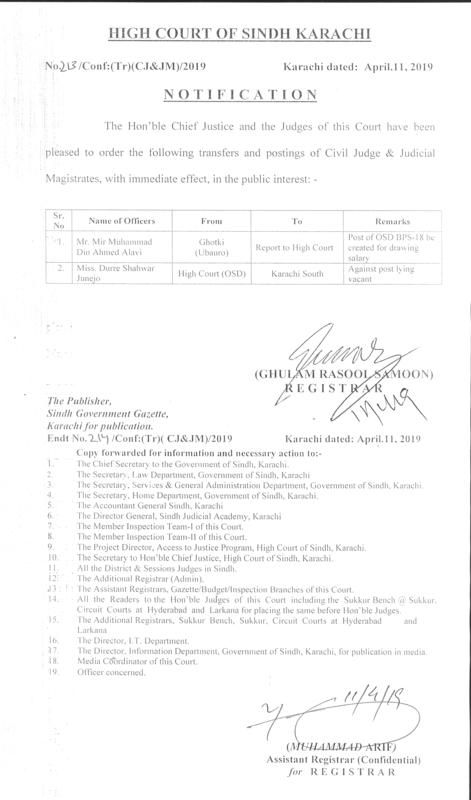 as mentioned against their names in the column of “Objection” in this list are required to remove the objection(s) on or before 22.03.2019 during office hours, to become eligible. Any objections for want of necessary documents reach after last date will not be considered. 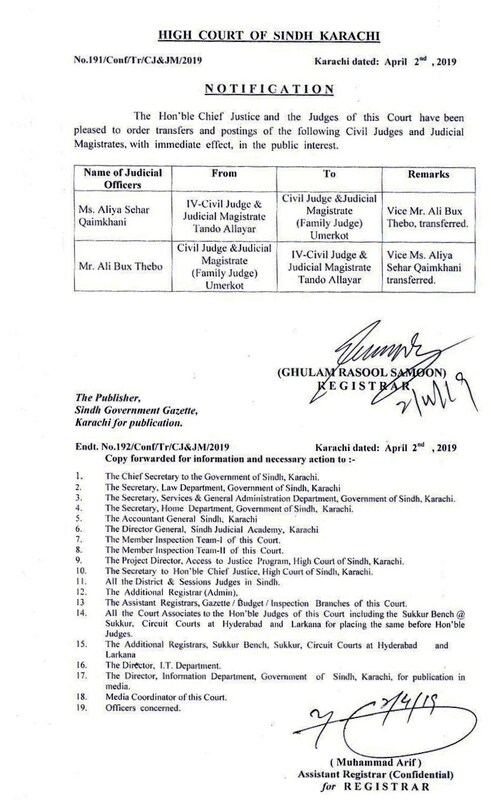 (2) The candidates who are found eligible but having minor deficiencies in their applications as mentioned in the column of “Remarks” are also required to remove those deficiencies prior to conducting of the first preliminary test. 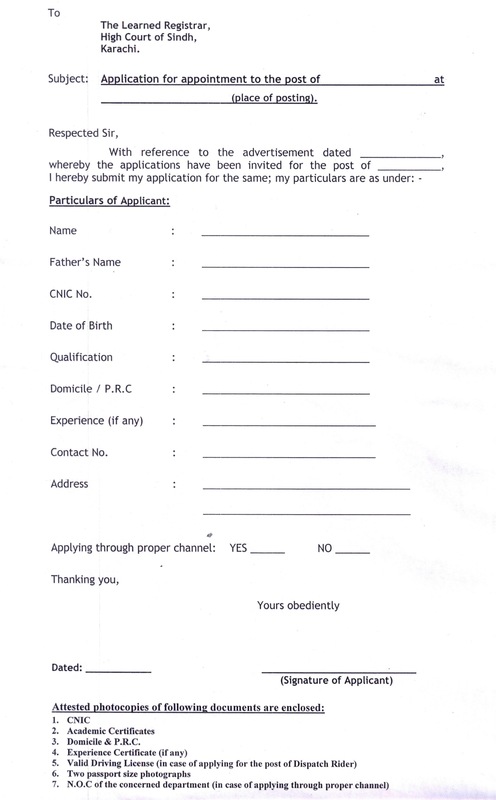 APPLICATION FORM FOR THE POSTS OF ADDITIONAL DISTRICT & SESSION JUDGE. NAMES OF SUCCESSFUL CANDIDATES FROM SERIAL NO. 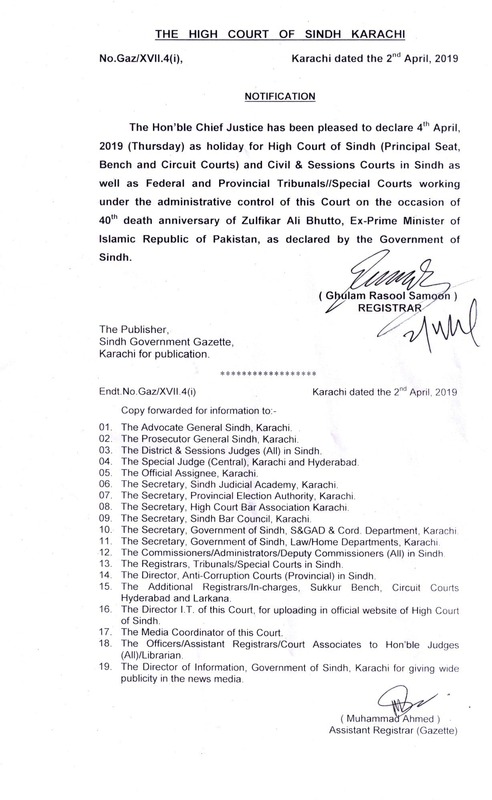 42 TO 93 FROM THE MERIT WISE LIST RECOMMENDED FOR APPOINTMENT TO THE POST OF CIVIL JUDGE & JUDICIAL MAGISTRATE (B-18). THE RECOMMENDATION SHALL BE FINAL AND CONCLUDING. NOTE: THE LIST CONTAINING THE RECOMMENDATION CEASE TO HAVE EFFECT FOR ANY FUTURE VACANCIES, FOR ALL INTENT AND PURPOSE. THE CANDIDATES FROM SR.NO.42 ONWARDS OF THE MERIT LIST ARE ALSO RECOMMENDED FOR APPOINTMENT TO THE POST OF CIVIL JUDGE & JUDICIAL MAGISTRATE (B-18) AGAINST THE VACANCIES WHICH WOULD BE FALLEN VACANT ON COMPLETION OF THE PROCESS OF DEPARTMENTAL PROMOTION COMMITTEE STARTING FROM 10TH FEBRUARY, 2018. 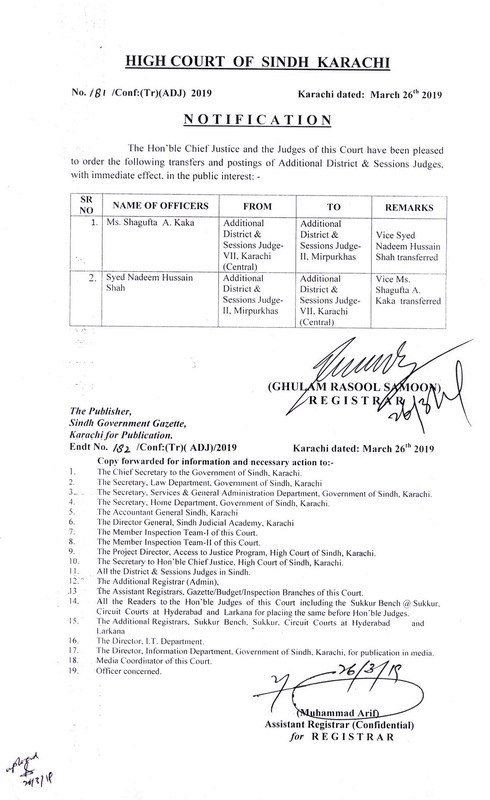 LIST OF CANDIDATES DECLARED SUCCESSFUL TO BE APPOINTED AS ADDITIONAL DISTRICT & SESSIONS JUDGE. After interview and overall evaluation on 07.12.2018, following candidate has been declared successful candidate. THE RESULT OF 2ND WRITTEN SUBJECTIVE TEST FOR THE POST OF ADDITIONAL DISTRICT & SESSIONS JUDGE HELD ON 08-09-2018 & 09-09-2018 HAS BEEN ANNOUNCED. FOLLOWING CANDIDATES WHO HAVE SECURED AN AGGREGATE OF 60% MARKS IN BOTH PAPERS ARE ELIGIBLE FOR INTERVIEW. THE INTERVIEW OF SELECTED CANDIDATES HAS BEEN SCHEDULED ON 7TH DECEMBER 2018 @ 03:00 P.M. 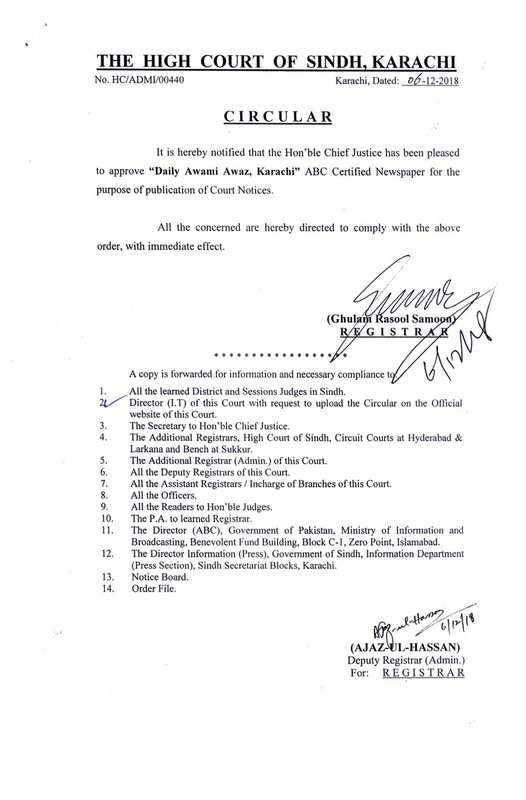 REPORTING TIME 02:30 P.M. AT COMMITTEE ROOM, MAIN BUILDING, HIGH COURT OF SINDH, KARACHI. 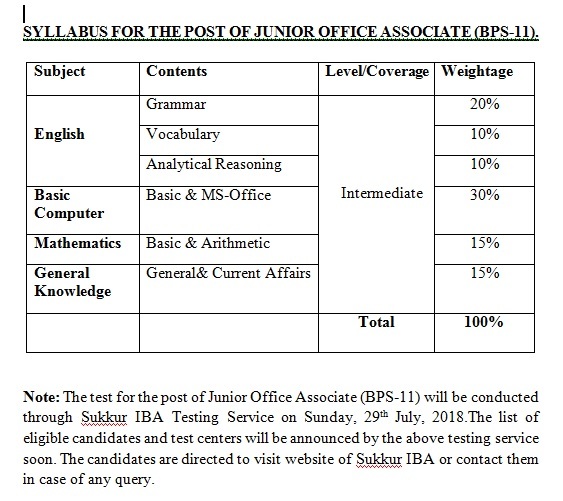 Merit-wise List of successful candidates for the post of Junior Office Associate (BPS-11). Merit-wise List of successful candidates who appeared in interview for the post of Junior Office Associate (BPS-11) conducted between 22-10-2018 to 07-11-2018 by the selection board. Merit-wise List of successful candidates who appeared in interview for the post of Junior Office Associate (BPS-11) on disabled quota conducted on 10-11-2018 by the selection board. 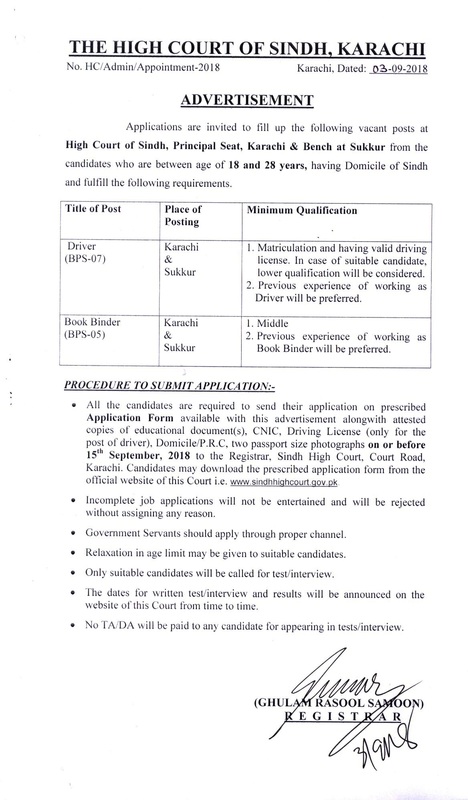 List of Eligible Candidates applied on Disable Quota for the Post of Junior Office Associate (BPS-11) At Principal Seat Karachi. 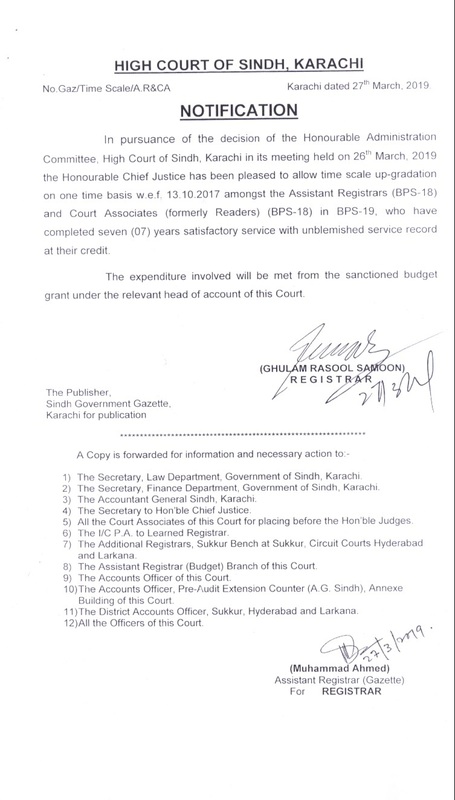 List of Eligible Candidates applied on Disable Quota for the Post of Junior Office Associate (BPS-11) At Circuit Court Hyderabad. 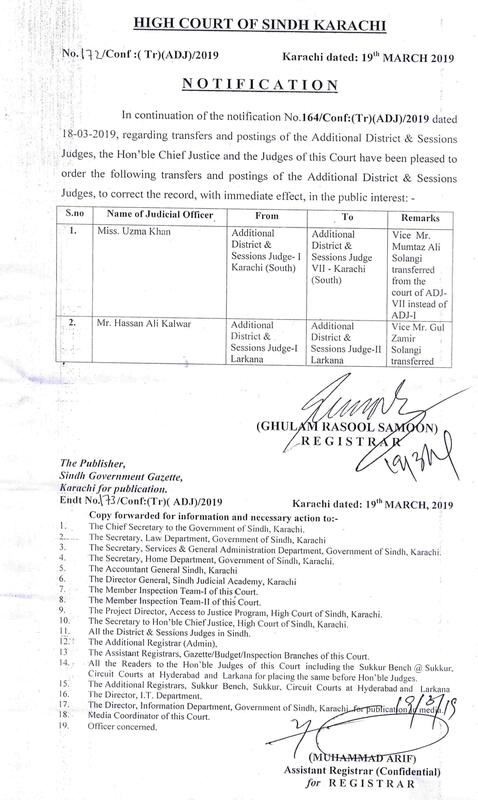 List of Eligible Candidates applied on Disable Quota for the Post of Junior Office Associate (BPS-11) At Sukkur Bench and Circuit Court Larkana. THE SECOND SUBJECTIVE TEST SCHEDULED ON 1ST & 2ND SEPTEMBER, 2018 HAS BEEN POSTPONED AND NOW THE SAME WILL BE HELD ON SATURDAY, 8th SEPTEMBER, 2018 AND SUNDAY, 9th SEPTEMBER, 2018 AT 10:00 A.M. (REPORTING TIME 09:00 A.M. AT REGISTRAR OFFICE, HIGH COURT OF SINDH, KARACHI). THE TEST WILL BE COMPRISED ON TWO PAPERS OF 100 MARKS EACH OF 3 HOURS DURATION WHICH WILL BE TERMED AS PAPER-I AND PAPER-II. 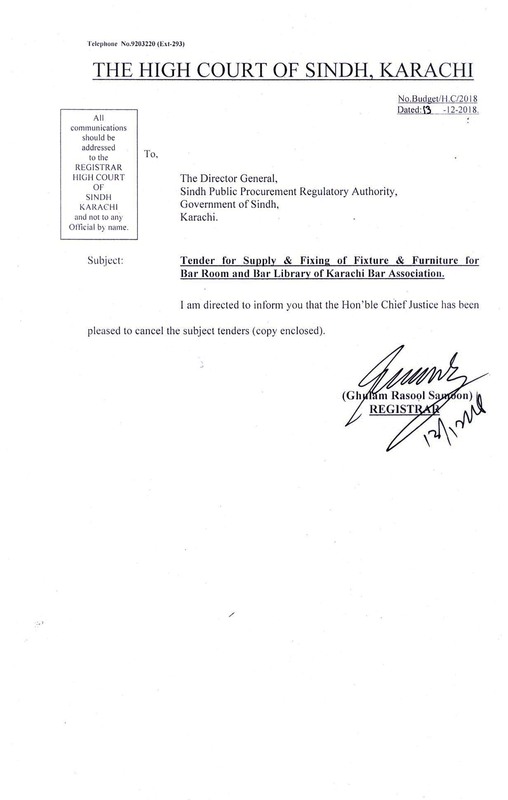 THE CANDIDATES WHO APPREARED IN THE FIRST PRELIMINARY TEST MAY APPLY FOR RECHECKING/RECOUNTING OF MARKS, AND MAY SEND THEIR APPLICATION DIRECTLY TO SUKKUR IBA TESTING SERVICE (STS) FOR ACTION AT THEIR END, (IF SO DESIRE.) INSTEAD OF SENDING THEIR APPLICATION TO THIS COURT. After conducting interviews held on 21.07.2018, the Hon'ble Selection Board has been pleased to recommend the following candidates for appointment to the posts and place mentioned against their names. Result of MCQ's Test for the Post of Junior Office Associate (BPS-11). . LIST OF ELIGIBLE CANDIDATES FOR PARTICIPATION IN THE FIRST MCQs TEST TO BE HELD ON SATURDAY, 11TH AUGUST, 2018 AT 10:00 A.M. 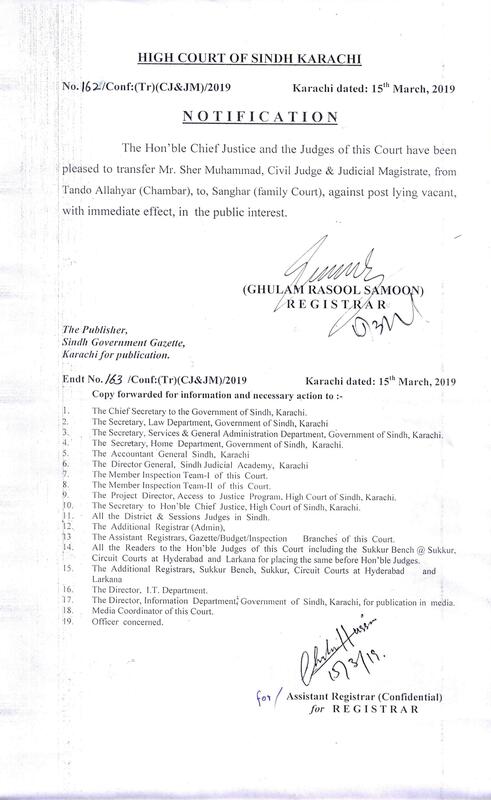 IN THE LAWNS OF SINDH HIGH COURT, KARACHI, FOR RECRUITMENT TO THE POST OF ADDITIONAL DISTRICT & SESSIONS JUDGE.